Sulaya teaches Arabic and English. Since CARE has supported the school the total number of students has risen from 300 to 450. Most of the new students enrolled are girls. CARE delivers girls’ education programmes in some of the poorest countries in the world. Opportunities for education in Somalia are generally limited. Years of civil war, drought and displacement have contributed to one of the lowest school enrolment rates in the world. CARE takes a holistic approach to girls’ education which goes beyond the classroom. We look at the wider reasons children can’t get to school, learn in school and stay in school. In Somalia CARE provides a tailored support to school-aged girls and their families, to help girls stay in school, transition from primary into secondary school, or enrol in non-formal classes if they have already been out of school for some time. Support from the players of People’s Postcode Lottery will pay for 40,000 marginalised girls in Somalia to have an education. A house is often a family’s largest asset. The loss of a house leaves people who are already living on the edge exposed to ill health, poor security, indignity and poverty. When emergencies strike, CARE works to meet people’s basic shelter needs: protection from the elements, security and a base for their livelihoods. Rohima (above) is one of the 900,000 people, living in a camp on the border between Bangladesh and Myanmar. The concentration of refugees is now among the densest in the world. 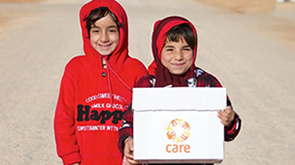 CARE has been working in the refugee camps since the beginning of the crisis providing emergency shelter and clean water, sanitation and more. CARE host a team of shelter experts, who are ready to be deployed at short notice to humanitarian emergencies, such as Cyclone Idai in Southern Africa, and the Rohingya refugee response in Bangladesh. Support from the players of People’s Postcode Lottery will enable CARE to provide emergency shelter expertise in five under-funded humanitarian emergencies, helping to safely house almost 100,000 people who have been affected by conflict or disaster. CARE International UK has received £250,000 from the players of the People’s Postcode Lottery.